Chief suspect for Ireland's biggest ever tiger raid has left the country but his €5.8m haul remains untouched.Gardai now believe that the man, in his late 30s and from Dublin's north inner city, is hiding out in Britain, and have liaised with UK police in efforts to trace his whereabouts.He emerged at the chief suspect for the College Green robbery in the 48 hours after the crime, when suspects for the raid were observed entering the home of the man's sister on Dublin's northside.Detectives believe that the man planned the robbery with the assistance of a family-based north inner city crime gang, who are themselves related to a well-known armed robber. The mastermind has been involved in armed robbery for the past 20 years, and first came to garda attention following a number of raids in Munster in the 1990s. He is regarded by officers as volatile when confronted but otherwise calm in the planning of his crimes.He has a number of previous convictions and his immediate family have also been involved in crime in the past. A close relative shot and injured a man during a raid.According to garda intelligence sources, neither the man, nor the other members of the College Green gang, have attempted to move the haul of cash which they are suspected of stashing in the hours after the raid on February 27 last. The robbery, which was Ireland's biggest ever haul from a tiger raid, was pulled off when bank worker Shane Travers was forced to take cash from a vault at the Bank of Ireland, College Green, hours after his girlfriend and two members of her family were held up at their Co Kildare home.No one was injured in the raid, which ended when Mr Travers dropped off the cash at a designated point in Clontarf. The raiders are believed to have moved the cash to an as-yet-unknown location on the city's northside immediately afterwards.Some of the money was then moved, and €1.8m of the cash was later recovered.Gardai suspect that the money was taken to a location in north Dublin, and is likely to have remained there ever since. A number of individuals suspected of involvement in the robbery have been placed under heavy surveillance since the incident and have "laid low" as a result, sources say. 67-year-old Rosario Gambino arrived at Rome's Leonardo da Vinci airport on a flight from Miami. 67-year-old Rosario Gambino arrived at Rome's Leonardo da Vinci airport on a flight from Miami. Wearing a gray jumpsuit and looking frail he sat in a wheelchair as he was escorted out by police officers.Gambino, an Italian-born New Jersey resident, was considered a top mobster in the New York-based crime family led by his late cousin Carlo Gambino.In 1984 he was convicted in a multi-million-dollar conspiracy to sell heroin in southern New Jersey and sentenced to 45 years in jail.Gambino was linked to the "Pizza Connection" probe, which broke a $1.6 billion heroin and cocaine smuggling operation that used pizzerias as fronts from 1975 to 1984.He was released in 2007 and transferred to an immigrant detention center in California to await expulsion, Italian police said in a statement. It was not immediately clear why the sentence had been reduced.Gambino has been wanted in Italy since 1980 on separate drug and Mafia-connected charges, and he is expected to face trial. Calls to a lawyer representing him in Italy were not answered Saturday afternoon. Kenneth Lavon Jones, 34, is charged with possession of a firearm by a convicted felon, possession of marijuana with intent to distribute and a parole violation. A gang intelligence unit with the Barrow County Sheriff's Office received a tip about Jones' alleged affiliation with the gangster disciples. Deputies set up surveillance and interview witnesses before a SWAT team moved in early Monday morning. Police found Jones in possession of a loaded .40 caliber pistol and marijuana, Sheriff's Office spokesman Investigator Matt Guthas said. "Given the threat that criminal street gangs pose to the community, (the Sheriff's Office) has committed to rigorously pursuing gang members and gang-related activity," he said.Gwinnett police assisted by providing a narcotics-sniffing K-9 unit, Guthas said. Bobby Speirs sentenced at Manchester Crown Court . Mr Justice Griffith Williams sentenced Bobby Speirs, 41,to serve a minimum term of 23 years in jail at Manchester Crown Court today.Bobby Speirs, 41, showed no reaction as he was convicted of his part in organising the bloody Brass Handles pub shootout in Salford three years ago. Speirs believed he had the 'perfect alibi' when he went to the game between Manchester United and Newcastle United at the time of the horrific shooting. He was watching the game from an executive box as he organised the 'hit' during half-time.He was using mobile phones to oversee a plot to send two gunmen to the pub and carry out a 'planned execution', according to the prosecution. The gunmen went into the pub and opened fire, wounding two victims in a volley of shots one Sunday afternoon in March 2006. But the 'hit' backfired as the would-be assassins were overpowered by other people in the pub. It is thought they were disarmed and shot dead with their own guns. Speirs was instrumental in planning the operation and kept in touch with two others involved by mobile phone leading up to the shootings. Within days, Speirs fled to Spain but he was extradited several months later. Speirs, who at the time lived in Butterstile Avenue, Prestwich, pleaded not guilty to conspiracy to murder but was unanimously found guilty after four hours of deliberations by the jury. Two others, Ian McLeod, an infamous Manchester gang leader, and Constance Howarth, had already been convicted at an earlier hearing of roles in the murder plot. The two would-be assassins, Richard Austin, 19, and Carlton Alveranga, 20, died after being shot in the chest. They had gone to the pub on the Langworthy Estate to kill but ended up losing their own lives. Among the customers in the Brass Handles at the time were David Totton and Aaron Travers, who were said to be the 'possible' targets. 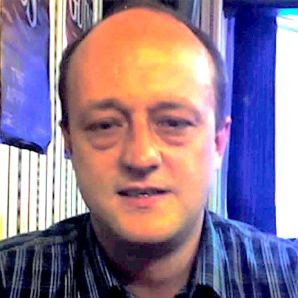 The gunmen went to the pub with McLeod while Howarth was inside acting as a 'spotter' to point out the victim or victims. Mr Totton and Mr Travers were seriously injured as shots were fired but survived. Some customers fought back and Austin and Alveranga were disarmed and shot during the botched assassination. No-one has ever been brought to justice for the murders of Austin and Alveranga. Speirs was trapped by police thanks to so-called 'cell site analysis' which plotted the movements of mobile phones associated with the defendant and others involved in the plot. He was tracked down in Benidorm. Speirs will be sentenced at Manchester Crown Court on Thursday. 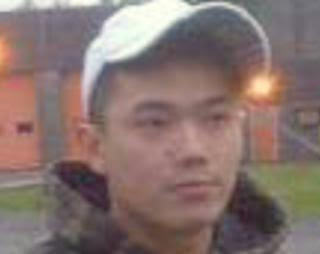 Dilun Heng, 26, wanted on a Canada-wide warrant since being charged last Friday with plotting to kill the Bacon brothers of Abbotsford.Seven others also charged in the massive conspiracy case have already made their first court appearances and will be returning to Vancouver Provincial Court on June 9.On Tuesday, four other accused -- Ion (Johnny K-9) Kroitoru, Daniel Ronald Russell, Soroush Ansari and Yong Sung (John) Lee -- squished into the prisoners' box at Vancouver Provincial Court for their first appearance after the charge against them was laid Friday.Last month, two other UN members and one associate - Barzan Tilli-Choli, Karwan Ahmet Saed and Aram Ali - were also charged with plotting to kill Jonathan, Jarrod and Jamie Bacon and their Red Scorpion associates.Prosecutor Ralph Keefer said he intended to proceed by direct indictment, meaning the case will move straight to B.C. Supreme Court, bypassing the preliminary inquiry process.Several plainclothes police officers sat in courtroom 101 Tuesday for the brief appearance. Four sheriffs crowded into the small prisoners’ box along with the four accused.Outside court, Ansari’s mother turned her back without saying a word when a Vancouver Sun reporter asked about the charges against her son.Another son, Sasan Ansari, was convicted of manslaughter last fall for stabbing his friend to death in the parking lot of a West Vancouver country club.Kroitoru’s spouse also refused to comment.“I’m not married,” she said in response to a Sun reporter’s question about her husband, a former professional wrestler and biker boss well-known to police in Ontario.But on a twitter page registered to a Tracy Kroitoru, a woman has posted several comments about being almost due with a baby daughter and references to her husband “ex-wrestler Johnny K-9.”“Pregnant, but wishing I could ride on the back on my man’s pro-one chopper,” Tracy Kroitoru wrote April 28.The murder conspiracy case is believed to be one of the largest in B.C. history with eight defendants charged on a single indictment.And the arrests of senior members of the notorious UN gang have been hailed by police as a major victory in their fight against gang violence. And UN founder Clay Roueche may still be charged, both police and the Crown have said. He is so far listed in the case as an unindicted co-conspirator along with someone identified only as “Frankie.”The conspiracy is alleged to have unfolded between Jan. 1, 2008 and Feb. 17, 2009 in Vancouver, Surrey, Burnaby, as well as in Montreal. 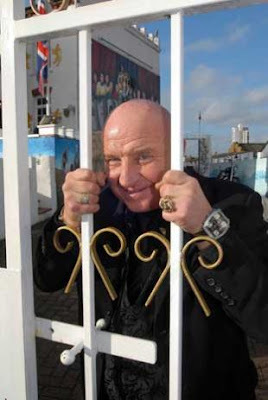 Dave Courtney Gangster, actor and author has been made bankrupt owing the HM Revenue & Customs, an estimated £250,000. Dave Courtney Gangster, actor and author has been made bankrupt owing the HM Revenue & Customs, an estimated £250,000.The published author, whose books include Dodgy Dave’s Little Black Book and The Ride’s Back On is understood to owe an estimated £400,000 to creditors.It is believed the taxman called time on Courtney’s debts and applied for the insolvency order against him. It is believed the case could focus on the book rights that Courtney retains his main asset as a way of settling creditor’s debts.Courtney had a small part in the 1990 film The Krays, and supplied the security at Ronnie Kray’s funeral. He is also reported as being the inspiration behind the character played by Vinnie Jones in the Guy Richie movie Lock Stock and Two Smoking Barrels.Papers lodged on the Individual Insolvency Register show that Louise Brittain, head of personal insolvency at Baker Tilley, has been appointed the bankruptcy trustee in Courtney’s case. The papers reveal he will not be discharged from bankruptcy automatically until 18 February 2010.Courtney’s registered address is a house in south east London, known as Camelot, decked out with union jacks and a large knuckle duster on the gate. Sivajodi Anantharaja, 41, organised the brutal retaliation after his cousin was injured by the 'East Side Boys' based in East Ham. Sri Lankan gang master in Britain who led revenge attacks against two rivals that left one man dead and another disabled has been jailed for at least 24 years. Sivajodi Anantharaja, 41, organised the brutal retaliation after his cousin was injured by the 'East Side Boys' based in East Ham.The first victim Mathiraj Mathiyaparanam, 24, was repeatedly slashed on the head and arm with a samurai sword in a shop in broad daylight.When he survived, the gang ambushed and killed Maheswaran Kaneshan, 26, in the street using an axe, swords and a cricket bat. Reputed Monte Park gang member is charged with being an accessory to a shooting earlier this month near New Bedford District Court and the Hastings Keith Federal Building, reports the Standard-Times.Police arrested Larry A. Pina, 17, of New Bedford over the weekend after witnesses said they saw him with two other suspects running from the scene.On May 1, witnesses reported hearing multiple gun shots in the downtown area. Three unoccupied cars were struck by bullets. Police found six shell casings. There were no reported injuries.Witnesses said they saw three black, teenage boys running from the scene. One of the suspects was described as having short hair and was seen walking into the McDonald’s on County Street. Vinh Truong is out on $25,000 bail. Police arrested Truong on Wednesday, charging him in connection with a shooting in Sandstone on New Year's Eve 2007.In the incident, disguised gunmen walked up to a jeep and opened fire on two men who both survived.The Calgary Sun reports, one of the men who escaped injury in that attack was Matthew Chubak. Police had pegged him as an associate of the "Fresh off the Boat" gang.Chubak was killed in January. The charges against Truong come on the heels of four men accused of attempted murder after a shooting in Chinatown last November.purported gang member charged in connection with a New Year’s Eve 2007 shooting has been released on bail.Justice of the Peace Will Shiplett today agreed to free Vinh Truong pending trial on two attempted murder charges and an allegation of discharging a firearm with intent to endanger life.Shiplett agreed with defence lawyer Charlie Stewart to release Truong on a $25,000, non-cash bail, providing his parents post a surety to ensure his attendance in court.Crown prosecutor Brian Holtby opposed Truong’s release, arguing his detention was necessary for the protection, or safety of the general public. Truong was arrested Wednesday and charged in connection with a Dec. 31, 2007, shooting in Sandstone, where disguised gunmen walked up to a Jeep and opened fire, riddling it with near two dozen bullets.One of the two men who escaped injury in the attack was Matthew Chubak — said to be an associate of the Fresh off the Boat gang — who was slain this past January.Chubak was also one of the targets of an alleged attempted murder last Nov. 16, in Chinatown, when four men in a car were shot at. Andre Francis Remekie was stopped May 8 at a Langley gas station by the uniformed component of the task force.“He was checked along with a well-known Lower Mainland gang associate,” Kirk said. “And he was found to have a warrant out of Edmonton for trafficking in cocaine.”The Vancouver Sun has learned that Remekie was with Sandip Singh (Dip) Duhre, a former associate of the late Bindy Johal who had been living out of province since two attempts were made on his life.Duhre and his brother Balraj were both targeted in shootings twice in 2005, with Balraj being wounded in a Vietnamese restaurant in east Vancouver.Sandip escaped injury when his car was sprayed with gunfire at a Surrey convenience store in May 2005, but his friend Dean Mohamed Elshamy was killed.In July 2005, both Balraj and Sandip were shot at as they drove through east Vancouver. Their bullet-proof sedan saved their lives.The fact such a connected B.C. gangster was in the presence of an accused trafficker from Alberta shows the networking ability of Metro Vancouver gangs, Kirk said.“We are fully aware that groups operating in this province have interprovincial connections,” he said.Kirk said the IGTF is going to use whatever means it can to make those involved in gangs accountable for their actions.“The use of Con Air to send this accused person to Alberta highlights the creative methods we are employing,” Kirk said.He said Remekie’s warrant was originally only for the Edmonton area, but police there agreed to extend it to B.C. so the accused could be arrested and sent back.Remekie, 28, was charged in Fort McMurray in 2004 with trafficking crack cocaine and possessing proceeds of crime.He was also charged with trafficking in Edmonton in 2000 after he and three associates were stopped in vehicle in which police say they found pot packaged for sale, a sawed-off shotgun, cash and several cellphones.Con Air was started by the Vancouver Police Department to fly accused criminals back to the jurisdictions in which they were facing charges. The program has since been adopted by other police departments and received an operating grant from the provincial government. Leaders Jeremi “J-Shasta” Chaplin, 22, earned a reputation of robbing drug dealers and shooting up parties and clubs beginning when he was 17. Other leaders were identified as Antonio “Tiger” Williams, 20; Reginald “Young Smoke” Lewis II, 23; Courtney “Chicago” Frierson, 19; Sharodd “Ville” Mitchell, 20; and Darien “D” Flowers, 19; and Vincent “Poppa” Byrd, 23. Seven men arrested in the past two years were the leaders of a violent street gang that wreaked havoc in Duval, Clay, Volusia and Leon counties.The men, all tied to Westside neighborhoods off 103rd Street, have been charged in the past few weeks under a state law that allows gang members to be prosecuted as members of a criminal enterprise. They are accused under the Racketeering Influenced Corrupt Organizations statute of committing crimes, ranging from robbery to car theft, for the gang or benefit of the gang. Police and prosecutors said with 204 felonies and 221 misdemeanors under their belts, business was good. And information released Tuesday about the men and their gang give one of the most detailed accountings of such violence ever made public in Jacksonville. The men face a maximum of 60 years in prison in the RICO case. They are being held on $1 million bail.Rutherford said another 17 gangs with 221 members are operating in the city. He called RICO a “big hammer” that he intends to use to eliminate those groups.The 18-month probe was labeled Operation 103rd St. CHB. 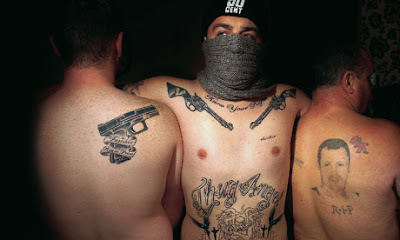 It was named after a part of the gang known as the 103rd Street Certified Head Bustas. Offshoots include the 103rd Street Savages or the 103rd Street Trap Boyz, arrest reports said.The gang began operating in 2004, made up primarily of people who grew up on the Westside around 103rd Street and Interstate 295, police said. Many attended Nathan B. Forrest High School, where the gang was started.Members began earning credibility by stealing cars from car lots and rental car agencies, petty hustling and selling drugs. Those who stole nicer cars than others were given more credibility. Those with the most money earned respect from gang leaders, who often split the proceeds of crimes, the arrest reports said.Members who robbed people on the street for gold jewelry wore it to build credibility. Younger members who wanted to earn respect volunteered to commit drive-by shootings. No shooting victims were included in arrest reports and Rutherford did not refer to any murders connected to the gang. $1 million cash-only bail was set today for the Latin Kings street gang member who was arrested in Maryland last week by U.S. marshals after being on the run since a 2005 murder on a Jersey City Heights street corner. The marshals used a taser to subdue Joseph "King Megs," Moreira, 29, formerly of Marshall Drive in Hoboken, when they arrested him last Friday night in Prince Charles County, officials said.Moreira was returned to New Jersey Thursday night and yesterday made his first appearance in court on charges he gunned down Juan Batista, 26, on Oct. 18, 2005, on the sidewalk outside a Palisade Avenue barbershop, officials said.Central Judicial Processing Court Judge Richard Nieto informed Moreira of the bail, but also told the defendant he would be held without bail because there is a detainer on him for a violation of parole and a detainer related to a Family Court matter. Moreira appeared via video link from Hudson County jail in Kearny.A tip on the Latin King's whereabouts led to a monthlong investigation by the Hudson County Prosecutor's Office.Prosecutor Edward DeFazio said when Moreira was arrested he "was refusing to admit who he was and didn't want to be cuffed and after not complying with the authorities, he was tased and taken into custody. "On the night of the 2005 shooting, Moreira got out of a car, approached Batista, and said something to him before opening fire, officials said. The victim was shot multiple times in the head and back, but managed to run a few steps before collapsing, officials said. The motive for the shooting was a prior beef between the gunman and victim, investigators said.Today, Moreira spoke privately for some time with Public Defender Don Gardner using the phone in the video conferencing room. Afterward, Gardner said he would note the matter they discussed, but he did not disclose what the conversation pertained to. The case against Moreira will now be presented to a grand jury seeking indictment.